Are You A Werewolf?, by Looney Labs, is comprised of 20 cards. Depicted on the cards are 12 Villagers, 3 Werewolves, 1 Seer, and 1 Moderator. The remaining 3 cards are blank and can be used by the game owner to create new roles in the game. Game set up is very simple. Sit everyone around in a circle and deal out to each player 1 card that defines their role for the game. A typical game deck of cards will always contain at least 2 Werewolves and 1 Seer. The rest of the cards will be Villagers. The number of cards in the deck is dependent on the number of players. Optionally, and only if no player volunteers, the Moderator card can be added to the deck. Otherwise, simply give the Moderator card to the player before handing out the cards. These are the people who live in the small village and are being terrorized by the Werewolves. Their only concern and goal is to find out who is a Werewolf and terminate them. The problem is, no one knows what a werewolf looks like or how to identify one. Like normal wolves, the Werewolves work in a pack and are hunting the Villagers, but only at night. During the day, the Werewolves look and act like all the other Villagers. During the night, they turn into killer beasts that hunt in silence and never miss their target. The Seer is a special Villager who has the ability to glimpse beyond the fabric of reality to divine information that others cannot obtain. In game terms, the Seer has the ability to find out if a player is or is not a Werewolf. Of course, having such an ability is a double-edged sword. First of all, the Villagers might not believe the Seer and think they are acting awfully suspicious. Second, if the Werewolves find out that a player is the Seer, they will most likely take them out as soon as possible. The Moderator is the player who helps keep the game going and directs the players during each phase of a round. The Moderator is neutral and knows everything, but can never share any of their knowledge with any of the players. The game is played in rounds with the Moderator directing the game. The round is broken down into two phases. Each phase and what actions are taken are summarized here. During this phase, all the players hide their eyes. Only the Moderator can see what is going on. The Moderator will tell everyone to “go to sleep”. Once the Moderator is satisfied that no one is peeking, they will ask the Werewolves to “wake up”. The players who were dealt the Werewolf role now look up, make eye contact with each other, and decide who they should maul. The choice must be unanimous and is done silently, using fingers to point, head nods, and head shakes. Once the Werewolves have selected their next victim, the Moderator nods, acknowledging they know who they picked, and tells the Werewolves to “go to sleep”. Now the Moderator tells the Seer to “wake up” (if the Seer is not yet removed from the game) and asks them to point to a single player. Whomever the Seer points to, the Moderator will either nod their head “yes”, to indicate the player the Seer is pointing to is a Werewolf or “No”, to indicate the player is just a normal Villager. Once the Moderator is done and is satisfied the Seer understood the response, the Moderator will tell the Seer to “go to sleep”. During this phase, all the players “wake up” and the real fun begins. The Moderator will tell everyone to “wake up” and identify which Villager has been taken out by the Werewolves during the night. That player now quietly excuses themselves from the circle and is out for the rest of the game. Players removed from the game, be it from the Werewolves of the Villagers, are not to speak or communicate with the other players for the duration of the game. All the other players must now debate who they will punish for the murder of the Villager who was just found dead. This is the longest part of the game and also the most intense. Keep in mind that the Werewolves are not known and are acting like a typical Villager! The Villagers know this, however, suspecting that there are enemies among them. IMPORTANT!!! : At no time during the game can any player show their role card. This information is to remain hidden until such time the player is removed from the game by vote of the players. A player can, however, tell the other players who they are if they think there is an advantage to do so, but they have no way of proving this until such time they are removed from the game. A player removed from the game by the Werewolves NEVER shows their role card! Unless, of course, you want to change this rule. After the Moderator feels the players have had enough time to debate and argue who is or is not a Werewolf, they ask the players to vote for one player in the game to be removed. This can be done by everyone pointing to a player at once on the count of three or by some other means. When the majority of votes is for one player, the Moderator asks that player to reveal their role card and leave the circle. This continues, for as many rounds as necessary, with a new round always starting with the first phase, until the endgame condition is met. The game continues until one of the two following conditions are met, signifying the game has concluded. If the final Werewolf has been found and removed from the game, the Villagers have won! If the number of Werewolves equals the number of Villagers, the Werewolves have won! 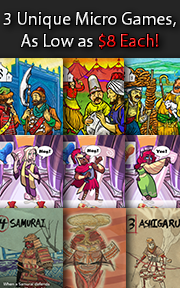 The game rules include a few rule variants that can be included or ignored. They are summarized here. No First-Night Kill: this variant allows the Werewolves to see each other during the first night, but they do not select a Villager to remove from the game. Instead, a Non-Player Villager (NPV) is identified as the first victim during the second phase of the round. This variant allows all the players a chance to play instead of one of them being knocked out of the game before they even get a chance to do anything. Night Noises: this variant requires all the players to make some sort of noise when they are asleep. For example, stomping their feet up and down. This is done to ensure that the Werewolves and Seer are not accidentally heard during the first phase of the round. Three Werewolves: this variant allows for a total of 3 Werewolves in the game, but only if the group is larger than 14 players. Timed Days: this variant sets a limit for the Villagers. If an individual has not been selected in the given time to be removed from the game via a group vote, no players are removed from the game and another round begins. It is in the Villagers best interest to quickly vote and in the Werewolves best interest to keep everyone guessing and confused. To learn more about Are You A Werewolf? and read the full rules, see the game’s official page. Before we get into the prediction, a quick history lesson. Are You A Werewolf? is a re-themed version of the game, Mafia, that was created by Dimma Davidoff in the mid 1980’s to be used with his students as part of a psychological experiment. The game was based on the same type of scenario as the game we are reviewing, but used criminals instead of supernatural beasts. A gentlemen by the name of Andrew Plotkin thought this rather drab and re-themed the game to include Villagers and Werewolves. Since its release, the original Are You A Werewolf? roles have been added to, the game is played in just about every game convention you will ever be lucky enough to attend, and continues to grow in popularity around the globe. Difficulty wise, this is not a hard game to teach. In fact, the only player in the game who really needs to know the game inside and out like a Boss is the Moderator. Everyone else can just take direction. What cannot be taught, and will make this game difficult for Child Geeks, is the meta game. On its surface, this is a simple variable player-role/player power game. Under the surface is a complex and constantly shifting social environment that pits one person’s sense of self against the masses with an ever-increasing level of paranoia. And if that sounds confusing to you, let me rephrase by simply saying that the most complicated thing about this game is staying true to yourself. Peer pressure is a significant driving force that is lead by a few very charismatic or strongly willed players who will persuade the rest of the players to either agree with them or take them out of the circle. For Child Geeks, this can be an incredibly complicated experience to both comprehend and to emotionally cope with. Especially if they feel they are being picked on. Again, teaching the game takes only about two or so minutes. The majority of my time was making sure I had the right group of people gathered to introduced the Child Geeks to the game. When playing with Child Geeks, it helps to play with families. I’ve played games of Are You A Werewolf? with mixed groups of strangers at game conventions and the circle can get really nasty. Next time you see me, ask me about the time one of the adults told a child that he was “stupid” and a “horrible player” during a game of Are You A Werewolf? at Gen Con. Yeah, not great. Once the group was gathered, we were ready to go! But before we played our first game, I asked my Child Geeks their thoughts on the game so far. Me thinks a kindly werewolf would make for a poor game. Let’s deal the cards, assign the roles, and see what fate has in store! This game was, as predicted, a difficult one for the Child Geeks to grasp. My 8-year-old was able to “get the game” much faster than his brother and it only took him a few rounds to get into the swing of things. 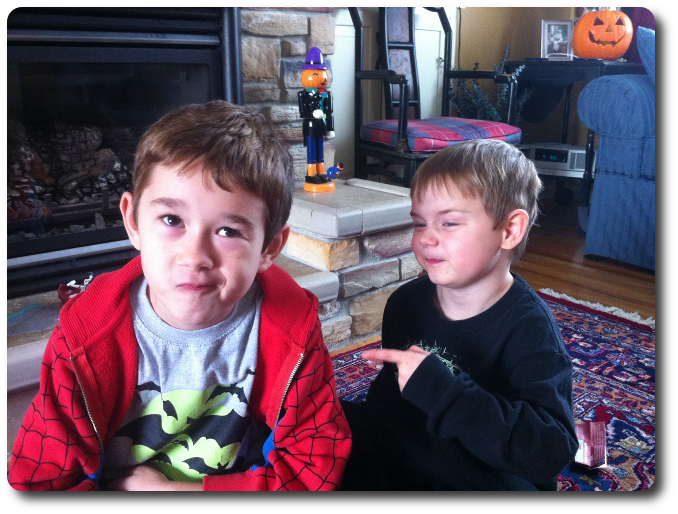 My 5-year-old, however, was never able to get to a point where he felt comfortable. There was simply too much going on around the circle, too much to think about, too much to listen to, and too much to keep in order. His brain started to melt before my eyes. He did, however, make it through an entire game, without quitting, which I was very proud of, but said he didn’t want to play the game again. My 8-year-old, on the other hand, had a wonderful time and looks forward to playing again as soon as possible. Based on his reaction to the game and his ability to play it, we can comfortably recommend this game for Child Geeks as young as 8, but do highly suggest that a “Child Geek Friendly Group” be gathered if you do include your little geeks in the fun. Parent Geeks also enjoyed the game and were surprised by the game play. None of them had played a game that had so little in the rulebook but provided such an incredible depth of play. The Parent Geeks got really into it and the non-gamers kept up from start to finish. This is a game of communication and deduction, of deception and misdirection. The Parent Geeks loved it but noted it was a game they could only play when their little geeks were older or when there were no little geeks around to interrupt The game play can be intense and every player must watch body language as well as listen intently to each player’s words to play the game effectively If there is too much noise or other distractions, the game will fall apart. This is a perennial favorite with the Gamer Geek group and it is always a good time. The real draw for the Gamer Geek is the “meta game”, or “the game within the game” that is played out around the circle. Attempting to outwit and outplay an opponent on a game board is one thing, but when your skills in negotiation, bluffing, and wordplay determine if you win the game, it takes on an entirely different level of importance. 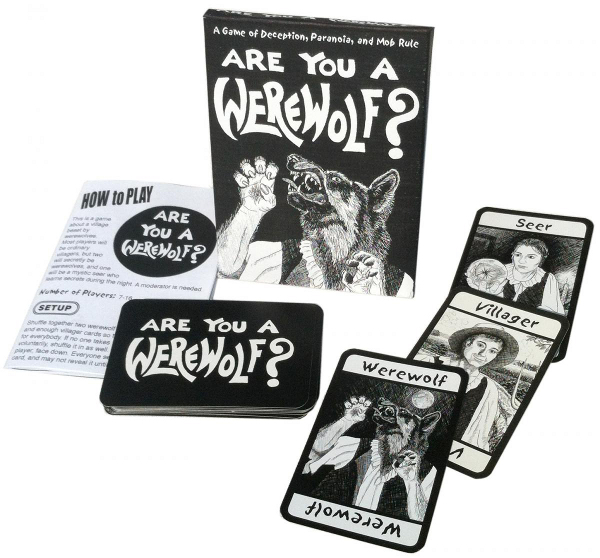 I have yet to play a session of Are You A Werewolf? with Gamer Geeks that was ever played quickly or with little interest. Games are intense, words are sharp, and you can sometimes feel the tension in the air like an electrical charge. Simply excellent. Gamer Geeks, if you are not yet familiar with this game, it is time you crawled out of the cave you’ve been hiding in all these years. Are You A Werewolf? is wonderfully challenging and engrossing, but is also highly dependent on the players in the circle being good sports and strong opponents. It is also suggested that every game have a veteran Moderator can provide vivid descriptions, group encouragement, and fair moderation. A group of players can get out of control, feelings can get hurt, and tempers can rise. If you can handle it, the game is going to be a great one and be the source of many memories and stories for years to come. Parent Geeks, this is a very interesting game of guessing what others are saying and being very careful to keep track of what you say, as well. No one really knows who or what their neighbor is and your friend across the circle who is smiling at you might be hiding oversized canine teeth. Each turn is intense with a high level of anticipation and an overwhelming feeling of relief when you are not removed from the game. Then, it’s off to the debates where players will argue with passion to keep themselves alive at all costs. Players can be teams but there is no telling how strong the bond based on paranoia s will keep anyone together. Simply an outstanding social game that will have you challenging yourself beyond any normal game’s means. Child Geeks, this is an intense game and one that you might find a bit too much. If you play this game, we highly recommend you play it with family and always keep in mind that you are not being picked on. The two hardest parts of this game are keeping your cool (don’t get angry if other players don’t agree with you or if the other players start to think you are a werewolf) and to keep every player’s story straight in your head. This game is not out of your reach, but it will require you to be fully invested in the game play. If you fail to keep track of what is going on or defend yourself, you will be out of the game quickly. Keep in mind at all times that your opinion is just as important (if not more so) as everyone elses. Play strong, play well, and you’ll have a great time. When we play the game with our Child Geeks, we reduce the implied violence level considerably. The Moderator says the Werewolves “carry villagers away” and are missing the next day instead of going into any graphic details about that player’s murder. This reduction in gore does nothing to reduce the level of game intensity. You, as a Parent Geek, can further reduce the odds of your little geek feeling frustrated, angry, and exasperated by making certain the circle is a good one from the start. Boy Scout Troops, social groups, church groups, and just about any gathering of friends makes for an excellent circle to play the game. We also highly recommend you play with the game variations that include no player being removed in the first round, the night noises, and using a timer to keep the rounds to a set length. The question always comes up about what to do with the players who are removed from the game. The simplest answer is “nothing”. The game is actually very enjoyable to just watch as a silent observer because you can see the game unfold. Seeing the Werewolves select a victim and then all the players squabble among themselves is something of a delight because the players removed from the game know very well who was responsible. This also gives the observing players something of an advantage for the next game because they can observe how certain people behave. Honestly, the hardest thing to do as a player who is removed from the game is to “stay quiet”. I greatly enjoy this game and always look forward to a chance to play it, but it is a game you have to be in the right mood for. The game is exhausting at times, both mentally and emotionally. I have yet to play a game where I don’t feel somewhat cheated, used, or abused. The game can bring out some of your Dark Side, if you know what I mean, and gives the players a unique glimpse of not only their opponents, but also themselves. Some people don’t like what they see and others, like myself, am always fascinated by how people act and react during the game. 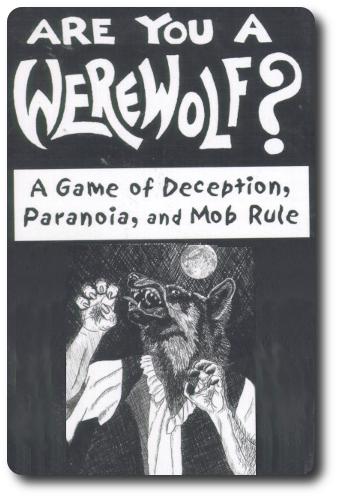 If you are looking for a game of deduction and manipulation that will take any party group you can imagine and have them turn on each other faster than a pack of hungry badgers, then do get your hands on Are You A Werewolf? You’ll be happy you did, even after being sent to the gallows by your friends and family. 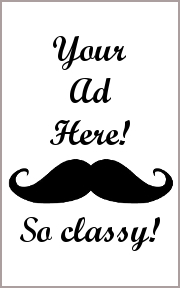 Tagged Bluffing Games, Deduction Games, Father Geek Approved, Gamer Geek Approved, Horror Games, Murder Mystery Games, Negotiation Games, Parent Geek Approved, Party Games. Bookmark the permalink.